Gurugram, 20th February, 2017: Oysters Beach, popularly known as Gurugram’s AppuGhar, had geared up to inject fun into the lives of Gurugram residents by bringing this year’s KrackerJack Karvnival at its premises. Interspersed between 18th and 19th of February, Oysters was seen as a complete entertainment hub, with visitors thronging to participate in the variety of events and exhibitions. With 120+ exhibitors and 20+ rides and games, the Krackerjack Karnival had signified critical success amongst both children and parents alike. Krackerjack Karnival is India's first most successful fun event dedicated to children and families. Being India's largest carnival, it is hosted annually in 4 major metro cities namely - Delhi, Gurugram, Pune and Bangalore. Krackerjack was a one stop destination for all, which focsed on SHOP, PLAY & LEARN- a concept where under one roof exhibitors get to introduce their products and services to thousands of consumers, while visitors enjoy a fun filled day with multiple activities etc. On this momentous occasion, Mr. Saurabh Kumar, General Manager, Operations at Oysters Beach said that, “We are delighted to get this prolific opportunity in hosting the annual Krackerjack Karnival. Oysters is known for hosting such vibrant events, providing fun and frolic activities for diverse age groups, making it go-to place for entertainment. Oysters Beach has always been at the forefront, providing a plethora of fascinating activities and entertainment to its audience, be it through its celebrity-based events, lip smacking food or thrilling rides. From hosting the biggest of Bollywood Nights with Mika Singh to celebrating the Independence day with pomp and gaiety, Oysters has ensured that it’s visitors are enthralled with the best-in class entertainment across all Delhi- NCR. Oyster’s strives to keep this momentum going while garnering hearts and accolades as it progresses further. 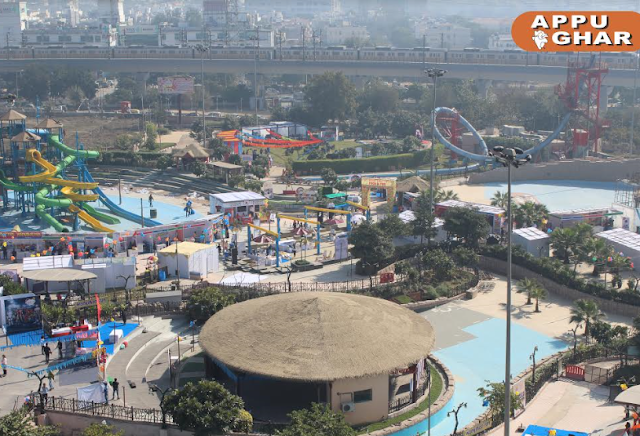 Oysters Beach is the first water park by International Amusement Limited (IAL), popularly known as “APPU GHAR”, was established in the summer of 1998. Since an actual Sea being hundreds of miles away, Oysters Beach has powerfully made you meet the best beach experience in town. Since its inception, Oysters has been the most loved destination among people of all age- groups. With an aim to offer a new, innovative experience to guests at regular intervals, Oysters has undertaken various creative transformations from being a Water Park to a Snow Park to a Heated Water Park in winters. Prominently spread across the entertainment district of Gurgaon, behind HUDA City Metro Station, Oysters Beach recently re- opened its gates on April 16, 2015. Apart from a plethora of fun & frolic activities, the park also has a rejuvenation center with a renowned spa to relax in peace. The Food Court at Oysters offers a wide array of cuisine and tantalizing mock -tails which will take you on an extremely appetizing culinary journey. The park also offers engaging games to satiate your gaming desires. With a kidz zone and sports like beach Volley Ball, Soccer, Tug of War, Oysters promises to chaperon nostalgia to Gen X & Gen Y.